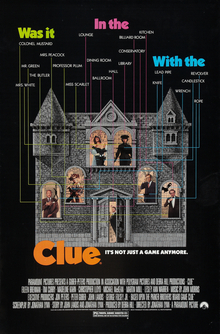 Gore Verbinski to Direct remake of: "Clue"!! WHY!??! Someone out there is a genius. Combining the best of two current Hollywood trends, the remake and the board game movie, Universal Pictures have reportedly hired Gore Verbinski (The Ring, Pirates of the Caribbean) to direct a movie based on the murder mystery game Clue. Readers that are old enough to remember the ?80s will probably recall that Clue is the one board game that has already been adapted to a movie; in 1985, Jonathan Lynn directed a feature film version starring Tim Curry and Christopher Lloyd. It remains to be seen if the new version will also be released with multiple endings. The good news is that this will not get in the way of Gore Verbinski?s plans to direct a Bioshock movie. Bioshock will still come first. What I want to know is, how many of these board game movies are actually going to end up getting made? They seem to be attracting a lot of big name talent for these things, but I still refuse to believe that people like Ridley Scott and Gore Verbinski are actually going to waste their time with them. What do you think, does Clue have more potential than Monopoly or Candy Land? Does anyone actually plan on seeing any of these flicks in a non-ironic way? Universal Pictures has made a series of deals with Hasbro to adapt board games and toys into big screen movies. Last year the studio signed Ridley Scott to develop a movie based on Monopoly. Over the past month it was announced that Platinum Dunes was developing a movie based around the Ouija board, Etan Cohen was writing a screenplay for Candyland with Enchanted director Kevin Lima to direct, and Steve Oedekerk to write a big screen adaptation of Stretch Armstrong. And now comes news that Pirates of the Caribbean helmer Gore Verbinski has signed on with Universal to direct and produce a live-action adaptation of the board game Clue. While most of the other properties might seem like odd choices, Clue has a murder mystery storyline that seems much easier to turn into a narrative story. As you know, the board game is set in a big mansion where a murder has taken place. The competitors try to uncover who committed the murder, Professor Plum, Ms. White, Col. Mustard, Miss Peacock, Mr. Green or Ms. Scarlet, what murder weapon was used, either a knife, rope, candlestick, wrench, pistol or a lead pipe, and what room the murder was committed in. The board game has made over $1 billion in sales over the last 61 years. The board game was previously turned into a big screen film in 1985, and while the black comedy was a critical and financial failure at the time of it?s release, the film has gone on to develop a cult following on DVD and television airings. Most interesting is that the film actually is one of the only mainstream movies I know of which was released with alternative endings. Depending on which theater you screening the movie, moviegoers were presented with one of three different endings. Newspapers listed the film with an A, B or C depending on the ending included with the print. It would be interesting if they tried to do such a gimmick in the Internet age, and if the gimmick would result in more ticket sales. Verbinski is an interesting choice because he has experience in bringing fantastical period stories to life with a great mix of realism and wonderful visuals. However, this is just one of the films that Verbinski has on his plate. I think I would much rather see his big screen adaptation of the video game Bioshock than another Clue movie.